Fraternal lodge organizations, or fraternal benefit societies, such as our Improved Order of Red Men of Green Lane, were widespread in the upper parts of Montgomery County one hundred years ago. In this railroad excursion broadside, which likely dates to 1913 (a 1914 year dated broadside featuring the same event price and generally similar information is also in the GH library collection), two other local lodges have joined forces. The Patriotic Order Sons of America and the Knights of the Golden Eagle of Ironbridge (now Rahns) sponsored a special one day train trip to Mauch Chunk (renamed Jim Thorpe in 1954). Measuring about 15 x 8 inches, much of the broadside’s text in the details is a modest sized typeface. 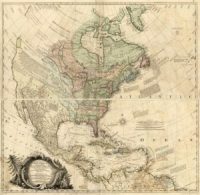 Depending upon the point of embarkation one could be at the destination within two to three hours or perhaps less. In light of today’s means of travel that may seem slow but remember: to cover that distance and make a return trip the same day with horse and carriage would have been almost impossible; an automobile ride over the generally less than stellar roads of the time would have been impractical and surely longer than the train ride if one even attempted. And that’s assuming you didn’t get a flat tire or one of many other common maladies befalling the autoists of the day. As such, it’s easy to see why railroad excursions were popular for brief sojourns. 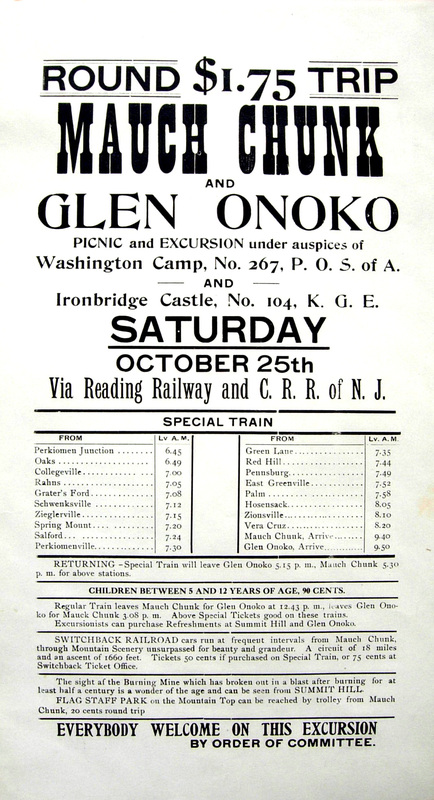 In addition to the excursions of 1913 and 1914, the GH collection also includes similar trip broadsides sponsored by the Iron Bridge K. G. E. in 1907 and 1908. Located in Carbon County, Pennsylvania, Mauch Chunk sits nestled between a sharp bend in the Lehigh River around Bear Mountain to the south and the Lehigh Gorge to the north. Nearby Flagstaff Mountain with its expansive vistas and Glen Onoko with its waterfalls and tranquil woodlands both served as peaceful getaway spots for vacationers. For those willing to pay out a few additional quarters, a switchback railroad ride could be taken through the mountains. The railway was initially developed to haul coal, but converted to people-moving when the industrial need faded. Featuring scenery noted as being “unsurpassed for beauty and grandeur” substantial portions of the railway were on a downgrade and therefore powered by gravity. This trackage was owned by the Central Railroad of New Jersey, thus one impetus for the attempted cross-selling of patrons! The burning mine at Summit Hill, a few miles from Mauch Chunk, was a noted curiosity for excursion goers. Reportedly it began burning in 1859. Postcards c1909 featured it as the “$3,000,000” fire with modest sized flames and smoke rising out of the ground. “Like Hell on Earth”, according to some accounts. After a variety of attempts at containment the fire was finally accessed and eventually died out. Today Jim Thorpe is again a tourist oriented town, and features scenic train rides on a fairly regular basis. Of course, one would now take an automobile to get there. Interestingly enough, though the Camp at Ironbridge is long gone, the Washington Camp at nearby Schwenksville is still in existence: one of only nineteen P. O. S. of A. camps still on the rolls in Pennsylvania.